Our Suite is the ultimate in luxury, individually designed and furnished, reflecting our love affair with Japanese design and culture. 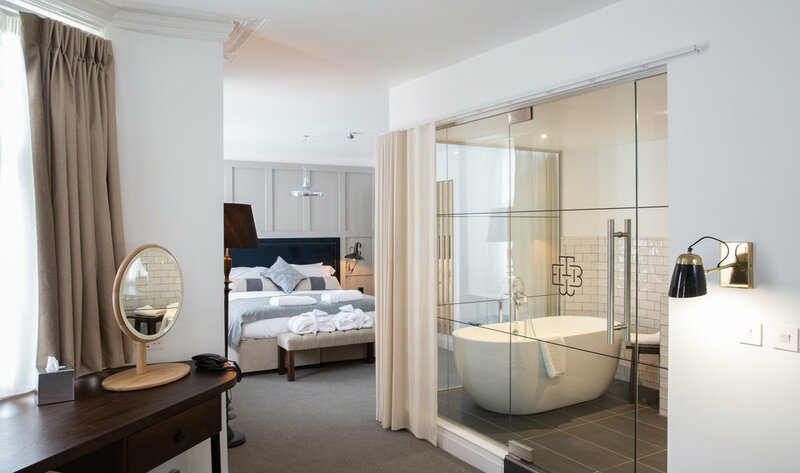 The suite boasts a luxuriously comfy super king-sized bed and bespoke mattress, finished with handmade British wool blankets created by Laura’s Loom of Sedbergh. Clean lines and natural tones are used throughout to create a peaceful ambience, in which to relax, drawing on the natural elements of water and air, that surround us in abundance. 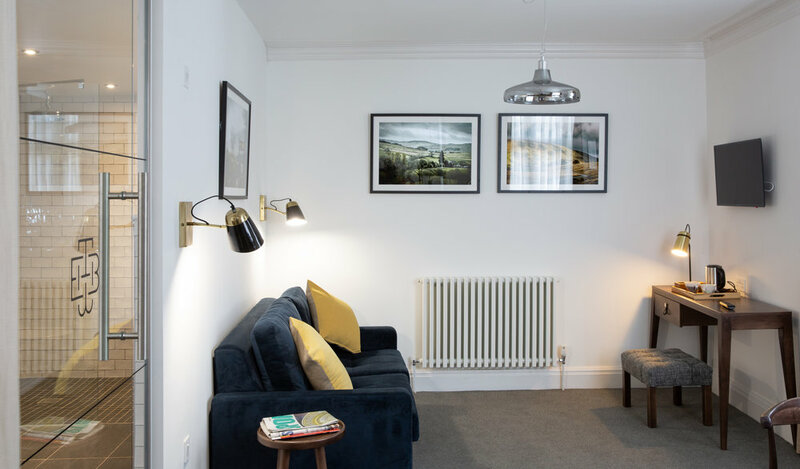 All rooms are tastefully finished with a selection of specially commissioned photographs of the local area by multi award winning photographer Rob Whitrow. This room has been carefully designed to emphasise the beauty and history of this former coaching inn, making the most of the original features including original stained glass, wooden panelling and ceiling beams. Alongside this we have sought to use local crafts people where possible to add touches of luxury to your surroundings and to connect you with the magnificent beauty of the Dales and the Howgill fells that surround you. The bathroom in this room boasts a luxuriously deep free-standing bath and an invigorating walk-in rain shower, where you can wash away the cares of the day with our range of bespoke ‘Petrichor’ toiletries; (a word which describes the evocative earthy smell of rain falling on dry earth), designed exclusively for us by The Sedbergh Soap Co.
Whatever your reason for a getaway, you’ll find the warmest welcome here at The Black Bull Inn.